Happy Easter! 2 years ago, I shared my Colourful Pancakes made with fruit and veggies instead of food colouring to achieve the bold colours. I thought I would share these recipes with you again this year. 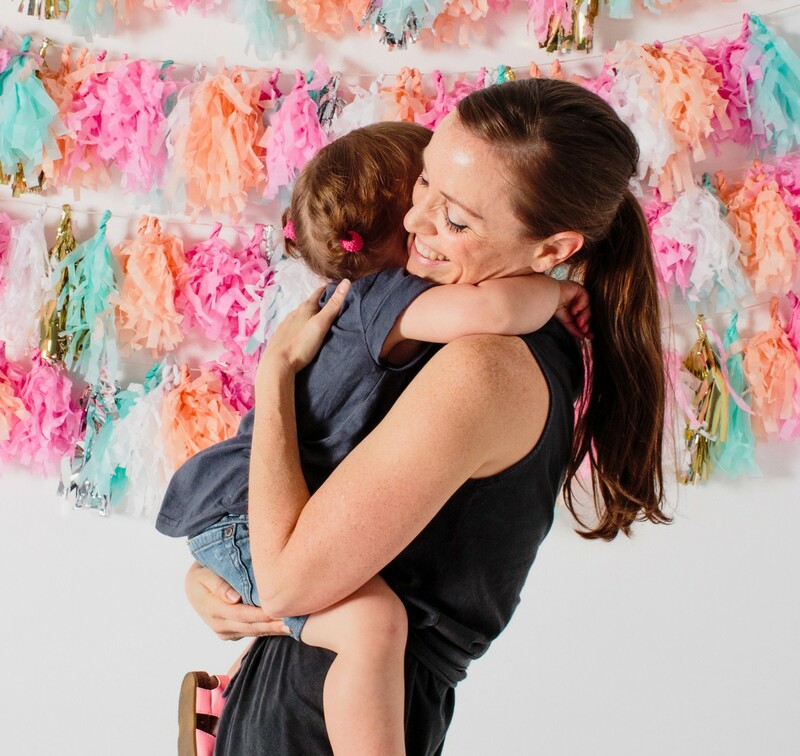 As I re-read this post, it has sparked more ideas on how to add even more colours naturally! Stay tuned…. Part of the Easter morning tradition in my house growing up was always the Easter Pancakes. 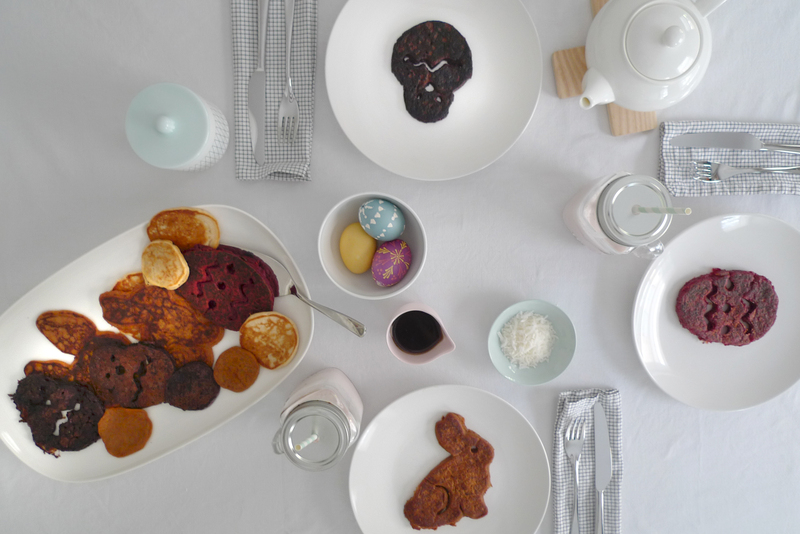 Every year my parents would make us colourful pancakes in the shape of Easter Bunnies. There would be pink, blue, yellow and green. 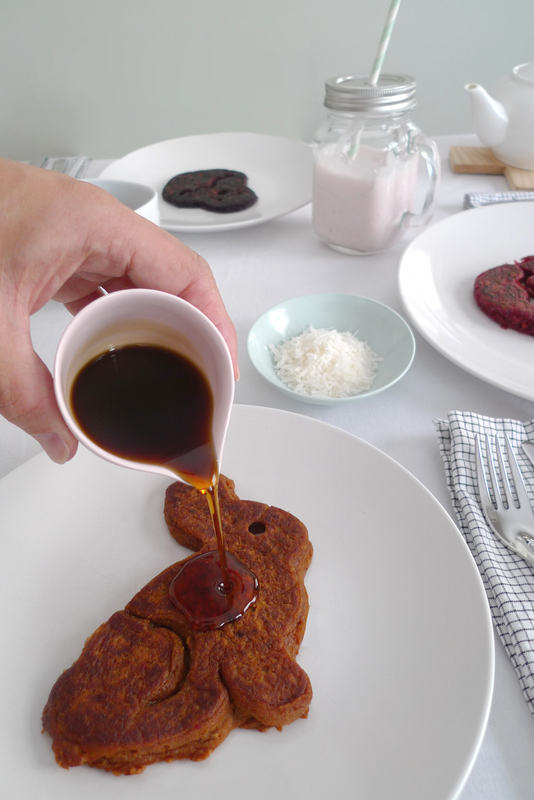 Of course they would be your standard pancake with food colouring, but for us they were magical, coloured bunnies. We loved them and they were there every year without fail. Last year we introduced the German way of egg dying into our family. This year I wanted to add a little bit of my family’s tradition, but I wanted to experiment a bit with the colour. Instead of food dye, we used fruit and vegetables. Orange from pumpkin…Red from beetroot…Blue from blueberries. The colours were not as soft as they used to be; they were deep dark colours. However, they were still a hit. 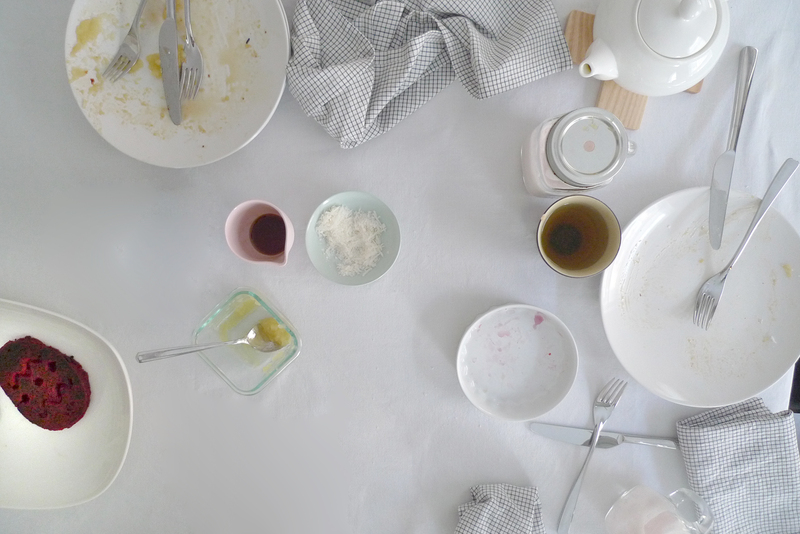 Charlotte ate so many pancakes, we couldn’t believe it. Her favourites were the pumpkin and plain pancakes covered in maple syrup and applesauce. It was so much fun to watch her (all of us really) get excited about breakfast. 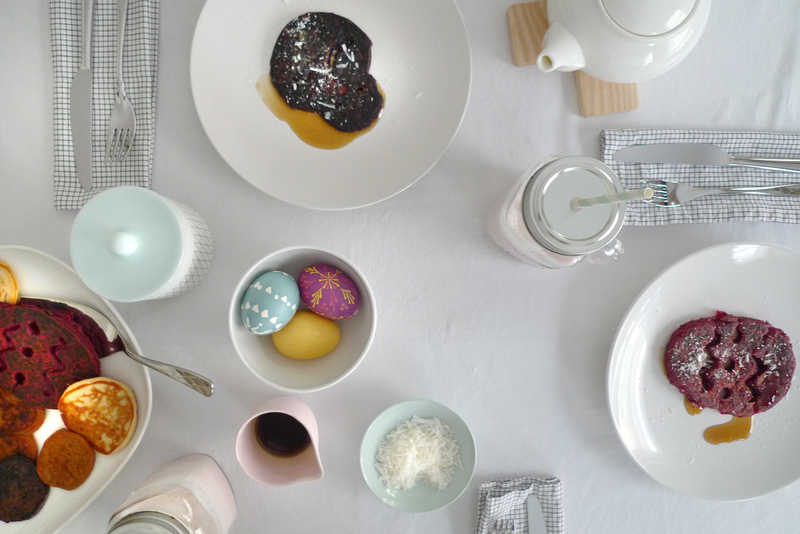 Apart from breakfast, check out our story on how you can celebrate Easter this year with your kids without the focus being on candy. There are two options in creating a Pumpkin Spice Pancake. Option 1: baked and pureed. To make the pumpkin puree follow the baked pumpkin recipe then stir in the spices into the puree. Combine the puree with the wet portion of the basic pancake mixture. Option 2: raw and shredded. Easy and great when you are pressed for time. Cut the pumpkin and remove the seeds and insides. Cut up in chunks then shred into your preferred consistency. Add the spices to the dry pancake mixture and the shredded pumpkin into the wet mixture. Follow the basic pancake procedure. The pancake molds we used were from Williams Sonoma. 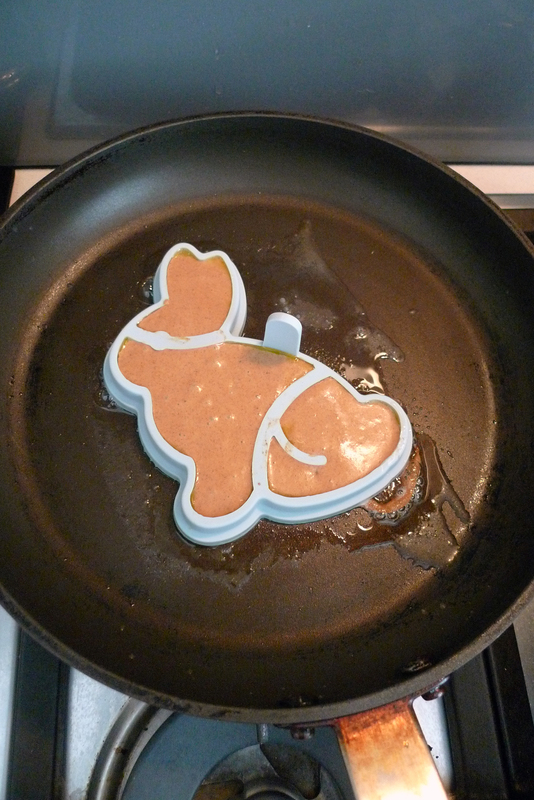 They were super simple to use and made our Easter pancakes just a bit more professional looking. We still loved the good old-fashioned type my parents made. Puree in a blender the roasted beetroot with the milk component of the basic pancake mixture. Combine the puree with the wet portion of the basic pancake mixture, combine and cook. To make colourful fruit pancakes, puree in a blender the frozen fruit of your choice with the milk component of the basic pancake mixture. Combine the puree with the wet portion of the basic pancake mixture, combine and cook. – Other colour ideas to try would be shredded carrot (orange) or avocado (green). – If the vegetables are too thick to puree, use a portion of the quinoa milk to thin it out. You may also not need as much milk as the recipe calls for so add slowly until the consistency is right. – For protein, substitute gluten-free flour with almond meal and flaxseed.